Creamy mushroom soup cook with sweetened, softened onions to make a savory sauce for pork chops. Serve this with your largest kitchen ladle -- the extra sauce will go fast. Melt the butter in a large, heavy saucepan over medium heat. Add the onion and cook until translucent, 2 to 3 minutes. Add the pork chops and cook until browned on one side, 2 to 3 minutes. Turn chops; add soup and sour cream, mix well, and cover. Cook over low heat for 20 to 25 minutes, until no longer pink. 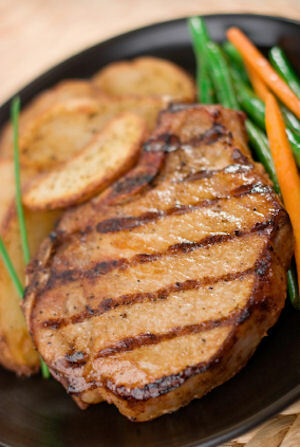 Back to the Pork Chop Recipes home page. Fried Pork Chops (yes, I live in the South). Mess. Instead I prepared this in a jiffy & it looked & tasted like I had worked on it all day. Recipe was a hit! We poured the extra sauce over noodles, delicious!! My 9 yr old didn't even realize there were onions in the sauce. Just got done fixing this recipe and eating the pork chops just wanted to let you know it was great if someone hasn't tried this you need too my whole family loved it thanks. Went down well in our household: "Best meal for a long time". Praise indeed! (And a lot cheaper than lamb chops). It was amazing. Kids loved it. Full of flavor. This was really good. The sauce was so simple and amazing! It's perfect. Tastes so good. Try it with gravy! Instead of mushroom and sprinkle Morton natures seasons while cooking! Whole family loved it especially my picky 4 year old. It was very good. I seasoned the meat with some black pepper garlic salt, a dash of brown sugar and onion powder a few hours prior. It was delicious. I forgot to grab some sour cream but I loved it nonetheless. Showing 10 of 28 total reviews and comments. Average rating of 4.20 stars based on 25 reviews. Summary: Creamy mushroom soup cook with sweetened, softened onions to make a savory sauce for pork chops. Serve this with your largest kitchen ladle -- the extra sauce will go fast.